IRRIGON - The Irrigon Knights (2A Blue Mountain) hosted Umatilla (3A Eastern Oregon) in a non-league volleyball match Tuesday afternoon. 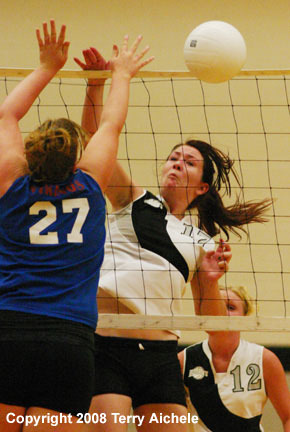 The Knights swept in three games 25-17, 25-22 and 25-18. The teams opened the first game staying close with Irrigon leading 5-4. Serves by Irrigon Christina Garzilazo took the Knights out to a 10-4 lead. Umatilla then closed back to within two 10-8. Irrigon was able to control the ball and take a 16-9 lead just past the mid point of the game. From that point on Irrigon pulled away to a 25-17 win. The Vikings put on a strong opening in the second game taking a 6-2 lead on the strength of Katelynn Schaefer-Cranston's serves. Irrigon's (player #1) put on a nice run of serve to tie it 6-6. Umatilla stretched the lead out to 12-9 during Selena Torres serve. During the Beth Reeves service Irrigon took the lead 13-12. Umatilla took the lead back momentarily 14-13. During the serves of Ariel Shock, which included an ace, the Knights took a 18-14 lead. Irrigon won the game 25-22. Umatilla started the final game strongly taking a 4-0 lead before the first side out. A long run of serve by (Irrigon #14) took the Knights into a 10-8 lead. Umatilla was able tie it up 10-10. Irrigon took the side out and Christina Garzilazo served on a 5-0 run to take the score to 15-10. Irrigon played hard and there were several long volleys during the last third of the game. The Knights took the third game 25-18. Irrigon coach Jill Wright was very pleased with the play of her young team. "It's nice to take a match in three games. We have a lot of go-getters on the team this year." Coach Wright points to the team leaders senior Beth Reeves and junior Alisha Wiser for doing a great job. "We have a great effort all away around the team. Ariel Schock, our setter, did a great today. We might raise some eyebrows this year." LEFT - An Irrigon player goes to the floor in an attempt to keep the ball in play. 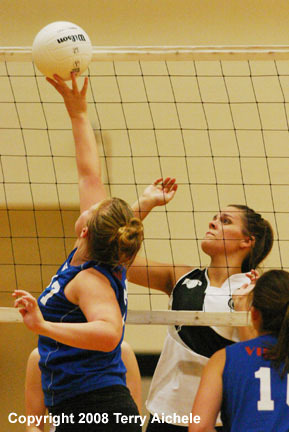 RIGHT - Ariel Shock, left and Leslie Coffman working to block a shot at the net. 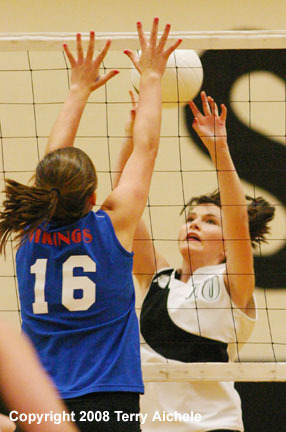 LEFT - An Irrigon player spikes the ball against Kaitlin Kennedy of Umatilla. RIGHT - Irrigon players attempt to block a shot. 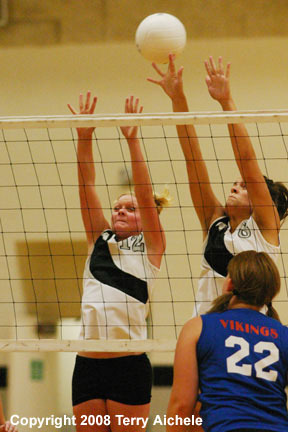 LEFT - Irrigon senior Beth Reeves, in white, at the net with Kassandra Kennedy in blue ready to block. 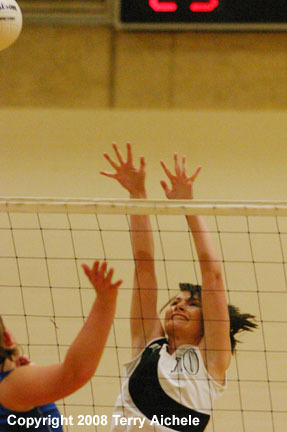 RIGHT - Irrigon senior Beth Reeves blocks a spike. LEFT - Irrigon's Ariel Shock makes a bump pass during the game Tuesday. 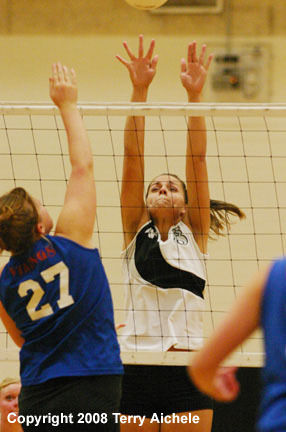 RIGHT - Leslie Coffman of Irrigon grimaces as she reaches to block a spike by Kaitlin Kennedy of Umatilla. 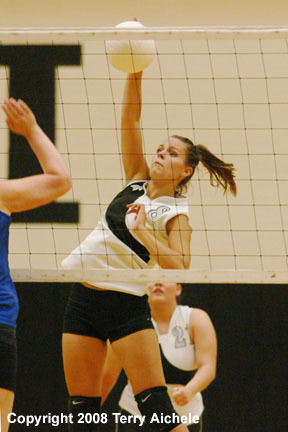 LEFT - Kaitlin Kennedy takes a soft finesse shot over the net during the match on Tuesday. 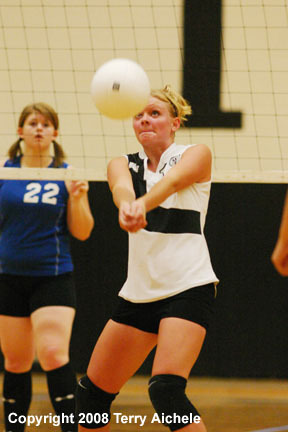 RIGHT - Leslie Coffman of Irrigon goes up for a spike. 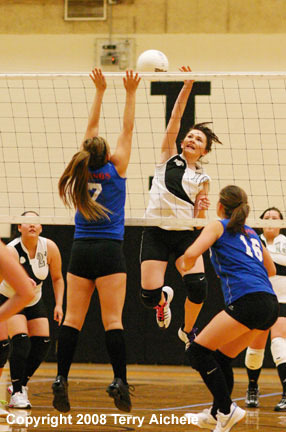 LEFT - Irrigon's Beth Reeves gets some serious air on a spike against a Umatilla player.